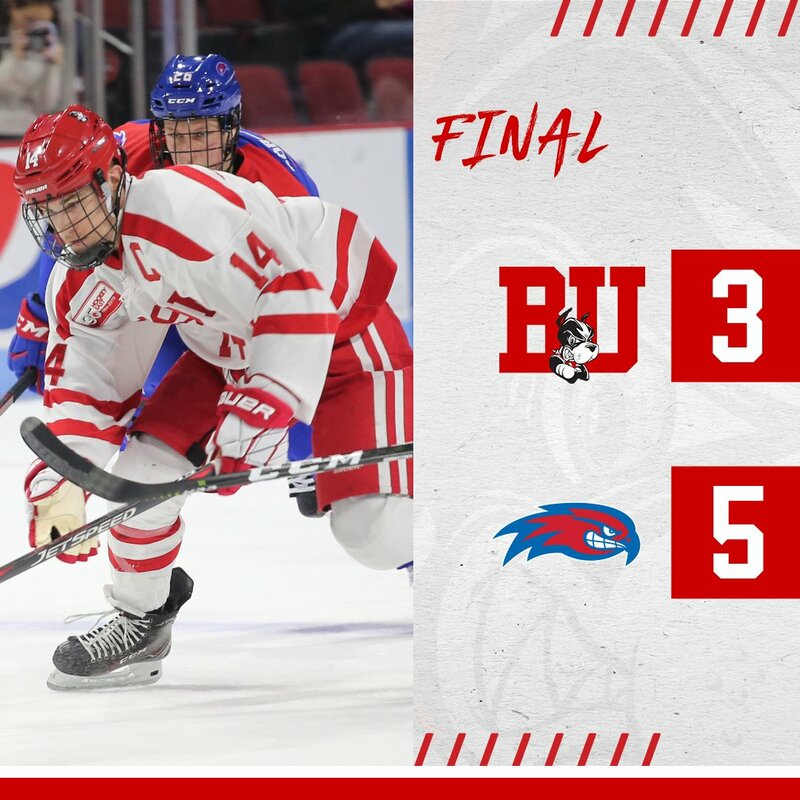 Terriers rallied from a 3-1 deficit to tie the game at three apiece, but UMass Lowell scored midway through the final period, then added an empty-netter to secure a 5-3 win at Agganis Arena. BU received goals from Ty Amonte, Cam Crotty and Bobo Carpenter. Freshman Joel Farabee assisted on all three scores. BU and Lowell complete the home-and-home tonight at the Tsongas Center in Lowell with puck drop at 7 p.m. Despite a 12-9 shot advantage, BU found itself down, 2-0, after the first period. Chris Schutz beat Jake Oettinger from the high slot at 6:37. Seven minutes later, following a Lowell shot blocked by the defense, Connor Sodergren buried the loose puck from the left side of the crease. BU got on the board early in the second period when Farabee carried the puck from the BU end down the right boards deep into the offensive zone and backhanded a pass to Amonte at the goalmouth for the sophomore’s third goal in the past five games. The River Hawks restored the two-goal margin at 12:58 on an odd-man rush with Anthony Baxter beating Oettinger from the left circle. Two minutes later, Crotty’s wrist shot from the right point skittered past goalie Chris Hernberg, who was screened by Logan Cockerill. For Crotty, who along with Shane Bowers, was rostered on Canada's World Junior Championships camp, it was his first goal of the season. BU tied the score on a power play early in the third period when Bobo Carpenter banged home a rebound from just outside the crease. Lowell scored the game-winner three minutes later. Oettinger turned aside Shutz’s sharp angle shot, but the puck went directly to an unmarked Seth Barton at the bottom of the right circle and he wristed it home. Charlie Levesque’s empty-netter closed out the scoring. Hernberg made 34 saves while Oettinger stopped 23 shots. Alex Chiasson scored his 12th goal in the Oilers' 7-2 thumping of Minnesota. Terriers stretched their winning streak to four games with a 3-1 win against RIT in Rochester. BU, which is 6-1-1 in its last eight games, received another strong effort in goal from Corinne Schroeder who stopped 27 of 28 shots. The teams meet again today at Noon. 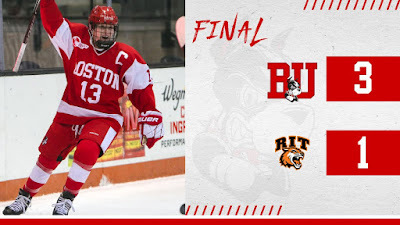 BU opened the scoring late in the first period when Natasza Tarnowski helped force a turnover, skated into the Tigers’ end and wristed home an unassisted goal. The Terriers increased their lead in the middle period with two power-play goals. Sammy Davis scored early in the period and Jesse Compher scored at 9:52. RIT responded with a power-play goal of its own late in the second, cutting the margin to two, but would get no closer.